Patrick and Shirley have been involved with the North Eastern Axemen’s Association Inc as office bearers, competitors and organisers for many years. Patrick started his term as secretary in 1975 which lasted for 26 years finishing in 2001. He also held other positions in that period. 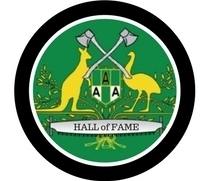 State president of the Tasmanian Axemen’s Association for 4 years. He also took over the job as starter in 1992 and still holds the position in the 2011 season. Patrick also chopped and was a great competitor reaching the final of the Tasmanian Thousand three times and was best placed fifth. Shirley held the position as Nomination Stewardess form 1982 to 2001 (19 years). During this time she also organised the Easter Monday Chopping Carnival and Annual Dinner Trophy nights and assisted Patrick with his roles within the Association.